For most of December, I am content to put the holiday playlist on shuffle and listen to whatever comes up. Sometimes that doesn't work so well, like when you get that excerpt from a long form piece - like the odd recitative from the Handel Messiah, or a bit of business music from the Nutcracker - in between the Silent Nights and Joys To The World. 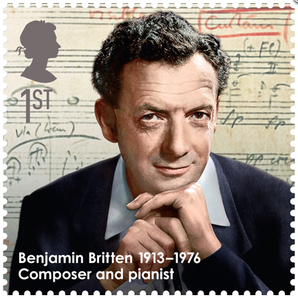 There's one long form piece that, for me, works both ways: Benjamin Britten's A Ceremony of Carols. I find that the individual carols flow within the shuffle, but it's also good to listen to it straight through. It's also amazing to sing, and because it's written for a three-part treble chorus, the choir at the women's college I attended was able to sing selections from it. Anyway - it is a stunning piece of choral music, and I can smell the gingerbread wafting through the kitchen as I listen to it. I couldn't find that recording on YouTube, but I did find a nicely filmed version sung by Sankt Jacobs Ungdomskör. It's cued up at the forceful Deo Gracias, but start at the beginning if you'd prefer.